Forklifts. Reach stackers. Mobile cranes. Material handling. Arial Platforms. Piling machines. We love things that move, and cylinders for the mobile sector are our home arena. For more than 60 years, PMC Cylinders has been designing and developing hydraulic cylinders for large and small companies worldwide. Our customers have one thing in common. They expect excellence in everything we do, which constantly challenges us to remain at the cutting edge. We also provide accessories such as piston accumulators, pulsation dampers and valve blocks. Europe´s leading suppliers of hydraulic cylinders for mobile applications. Read more about our offer in Mobile cylinders – Our home arena. Watch the film Mobile cylinders – Our home arena. Thanks to our Vaggeryd unit’s excellent reputation and long experience of the mobile sector, the world wants more of us. We are flattered by this, and as of July 2018 we will become an independent company dealing exclusively with the mobile sector. This venture will require a lot of work and strong investment in capacity and personnel. The units in Sävsjö, Vetlanda, Hällaryd and Nastola Finland will focus on the business areas Mobile Systems, Industry, Energy and Offshore & Marine together with the newly acquired Arcos Hydraulik. They will operate under the name of Arcos Hydraulik, which will be a sister company of PMC Cylinders. Successful fair week at Bauma! 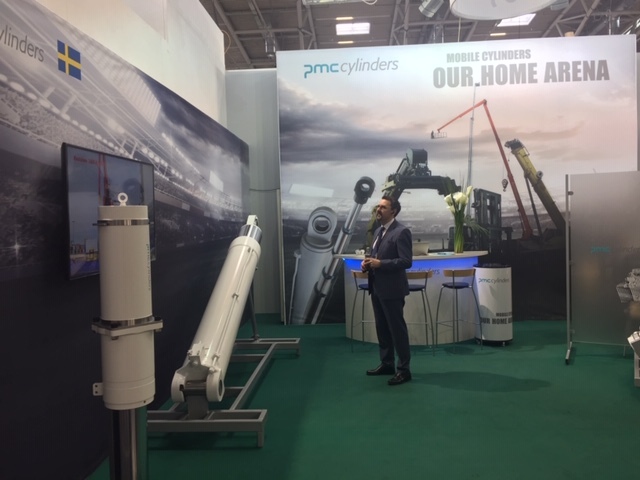 On April 8-14, we presented our offer Mobile cylinders – Our home arena, at Bauma in Münich. Now we are back in Sweden after a very successful fair week. We thank every one who visited our booth! You will find us in Hall A3, Stand 109. Welcome!